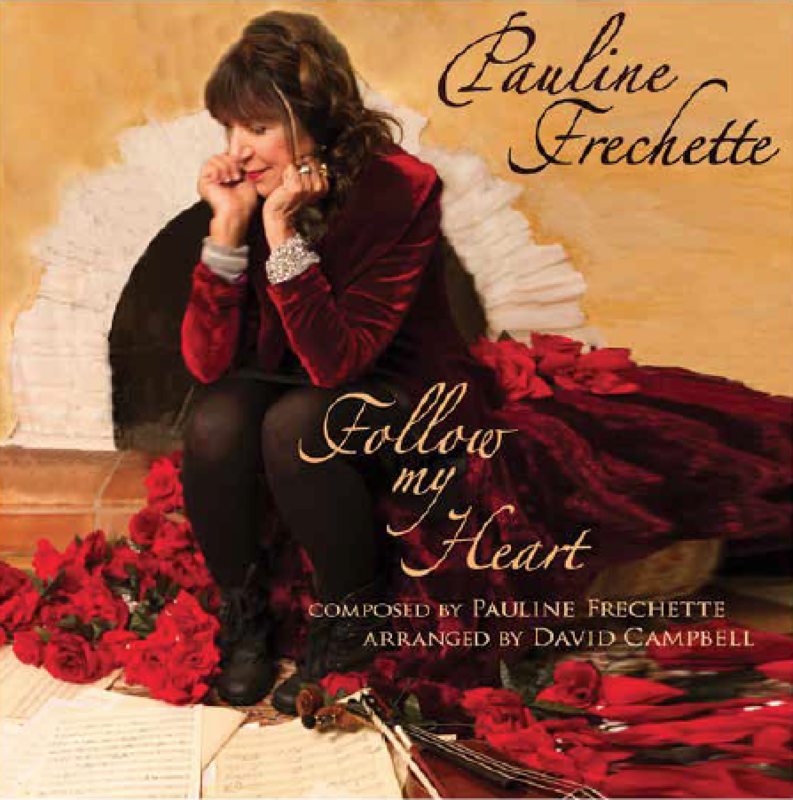 With her latest EP release, “Follow My Heart”, Pauline Frechette creates emotional music that is simple and melodic with poetic lyrics that tell her story. The EP includes both a vocal version and instrumental version of the same song. In the vocal rendition, Pauline’s technically demanding vocal is delivered with such a purity of heart and with such honesty that it created quite a visceral effect on me. I felt myself pulled into her world. In fact, I was caught quite unaware of how deeply it affected me emotionally. There is something about her breathy delivery of her intimate lyric that brought me back to the pains of my own early discoveries of love and life. Here’s just a sample of her lyrics: “Follow my heart to a time when I first discovered love, and the summer wind caressed my salty tears.” and “Follow my heart to a time when I first discovered life, with the beauty of a symphony I cried.” … “There, all alone I was one with the night. Barely breathing, capturing the stars.” There’s something about that last lyric, sung with cascading notes accompanying it, that took me back to my teens – lying on the beach, listening to the waves and allowing myself to get lost in the stars. After falling in love with the vocal rendition, I wasn’t sure I wanted to hear it as an instrumental. But I was pleasantly surprised to find myself again transferred from Earth into the stars with the strength of her communication being told in her melody alone, even devoid of any lyric. Stewart Cole is featured on trumpet in this sensual and jazzy instrumental version. Known for his virtuosity with Edward Sharpe & the Magnetic Zeros, Stewart brought his own brand of dynamic flare and personality to the song. I could easily hear either track, the vocal version or the instrumental, being played in a smoke filled jazz club somewhere in Paris or Berlin. It’s definitely a song that will stay with you long after the first hearing. The legendary David Campbell is the arranger/producer of this EP. His credits include arrangements on more than 500 gold and platinum records. (Go to davidmusic.com to hear more of his work) And with Pauline Frechette’s, “Follow My Heart” he has created yet another stellar arrangement by weaving two cellos, one acoustic bass and a tenor saxophone into a landscape of musical counter-point as dictated by Frechette’s original piano score. The music and vocals to “Follow My Heart” were recorded together live in Hollywood, at Capitol Records, Studio B where such legendary singers as Frank Sinatra and Dean Martin recorded some of their most classic songs. Not a wonder that Frechette chose that studio to record “Follow My Heart” since her song has all the markings of becoming a classic itself.